I'm going to be honest. I've wanted to write this blog post all summer but have really struggled to find the right words and the the courage to write this post. But with 2 days before I head back to university to start my final year, I thought it was about time that I sat down and shared a bit about my university experience so far. Before heading to uni, I was so excited about meeting new people and making new friends. Unlike many, I am not the first in my family to go to university so have heard many stories from my family about the friends for life they made whilst studying. Everywhere I turned from school to twitter, I saw people talking about how university is 'the best years of your life' and how you'd make 'friends you'll never forget' but for me that simply hasn't been true. In academic terms, my university career has gone to plan so far. But a degree isn't the only thing I was hoping to leave university with and I can't help but feel like I've missed out on your stereotypical 'uni life'. The worst part is, I don't feel like anyone is to blame, I was just dealt a bad hand. I remember the day I moved into my first year halls so clearly. It was an unusually warm September day, and we were all sweating as we carried my mountain of belongings from the car that was parked miles away (thanks to me forgetting to book an arrival slot). After an hour of unloading things from the car, there was a tearful goodbye with my parents and I was left alone. The flat was quiet, and unsure of who had moved in, I propped the door to my room open and started unpacking. Time went on and people started to move in but apart from a brief smile or hello, no one introduced themselves let alone came for a chat. It was getting late in the day and my final flat mate was moving in. I'd finished unpacking but left the door to my room open in the hope someone would come from a chat. Finally, it worked and Susha (who had moved in last) popped in for a chat once her parents had left. She was lovely and we agreed to meet later to go out and try meet some more people. The time to go out came and we decided to knock on everyone's door to see if anyone wanted to come out with us. Out of the seven girls in our flat only one other girl agreed to join us. The three of us then went to find others to have pre drinks with and found a flat on our floor that were welcoming people in. Everyone seemed nice, but there were only a few other girls as the majority of the floor were boys. While I'm happy to be friends with anyone regardless of gender it seemed like most of the boys were only interested in being something more than friends (if you know what I mean). Anyway we all went out that night and continued to meet up for drinks every night that week. But as the week went on I started to notice friendships and cliques forming but somehow I didn't fit into any of them. This was also the week when I met my now boyfriend (of nearly three years) Karl. We'd just had our very first lecture, and were leaving down the steps of the main building. As I looked around everyone seemed to be talking to someone, apart from me and this one other boy walking next to me. As we walked down the stairs all I could think was 'Shall I try talk to him? Shall I try talk to him? Or will he think I'm weird?' until I eventually plucked up the courage to start a conversation. We started chatting and instantly had things in common, he was so perfect that it was almost as if someone had told him all my favourite things before we met, and we've been pretty inseparable since. He introduced me to his flat mates (who were a lot more social than mine). I tried my best to fit in with them but by this point it seemed like everyone's friendship groups were 'full'. They were nice and would occasionally include me but no matter how hard I tried they already had enough friends. This theme continued into my second year. I'd meet new people and we'd always really get along but never quite enough for them to start including me as part of their friendship group. Now this blogpost isn't meant to sound like a pity party. While I may not have made many friends at university, I have found my best friend in my boyfriend Karl, I also still have a great group of friends at home and a group of friends who I worked with on my placement year in Leicester, that I still keep in touch with. I'm just trying to say it's okay for university to not be the best years of your life. So much pressure is put on the whole university experience. Right from the pressure to apply, to achieving top grades and gaining a massive group of friends that you go on wild nights out with. Moving away from home is hard enough let alone feeling like you don't quite fit in, but I'm sure you're not the only one. Making friends isn't always easy and you might not have found people that you 'click with' just yet. You might never find them at university and that's alright. Just because you don't make friends at uni, it doesn't mean you will be alone forever despite it feeling quite lonely right now. For most people University takes up about 3 years of your 80 year long life, so you will have plenty of other opportunities to meet new people throughout your life. Despite the pressure around you, try not to put pressure upon yourself. Be honest about how you're feeling and talk to someone about it, because it's nothing to be ashamed of if things aren't going the way you'd imagined. Instagram vs Reality : How Far Should We Stretch The Truth? 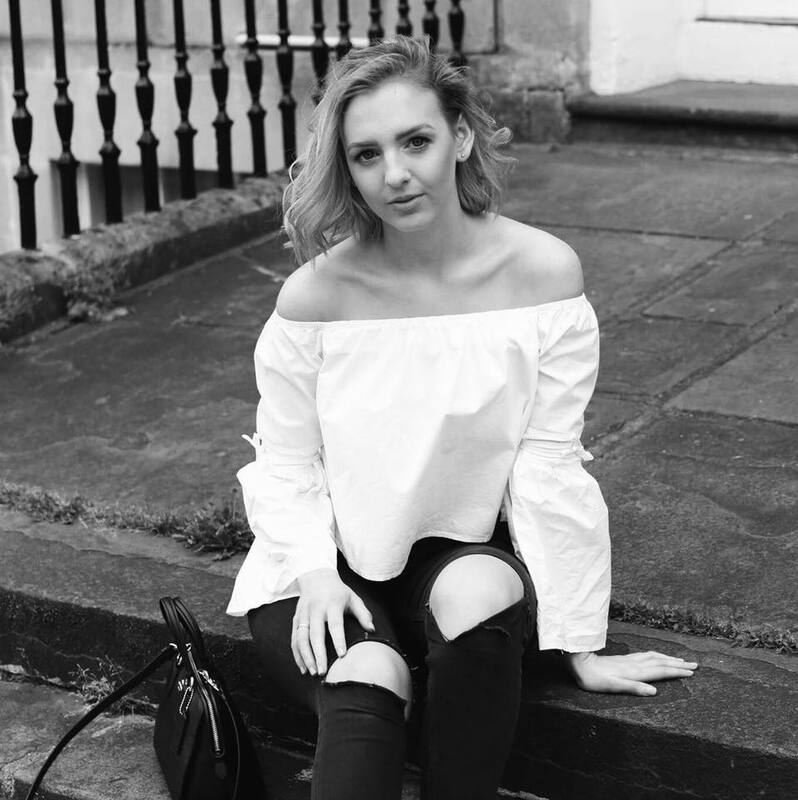 Another week and another drama has rocked the blogging boat, with Scarlett London finding herself right in the middle of it. Earlier this week she came under fire from Twitter trolls and keyboard warriors alike, criticising the 'reality' of her Instagram post promoting Listerine mouthwash. Like many of Scarlett's posts the photo was pretty, pink and aspirational; but most importantly it was staged. While this may have come to a shock to many people on Twitter, the rest of us are aware that adverts (which is what this was) are often staged. But it's not just adverts that are staged; magazine shoots, films, television programmes, photographs and many more are also set up to create a certain aesthetic or appearance. For example lots of food and drink in movies is not edible or it may be substituted for something similar, e.g. when an actor is drinking 'Vodka' in a film it's actually water and ice cream is mashed potato. Similarly when we were shooting for a catalogue or an advert at work, we wouldn't always shoot on location. So while it would look like a beautiful room in a house, it would actually be a studio styled to look like a room in a house, even including fake windows with a photoshopped view. The truth is lots of industries don't present us with reality, because reality isn't always that pretty. Instead we are given a perfectly packaged, Truman Show style world that sets our hearts racing and our imagination running. And I don't mind that. Media is there to tell a story and that is exactly what Scarlett was trying to do through her Instagram post. It also something many bloggers, including myself, do to try and engage their audience. I'm not ashamed to say that the image I posted on the morning of my 21st birthday was taken during the afternoon on the previous day. I got into my pjs, blew up some balloons are arranged them on my bed to look as though I had just woken up and was about to open all of my presents. I then edited the photo and posted it on my actual birthday, when I knew I wouldn't have time to take photos because I would be spending the day with my family. 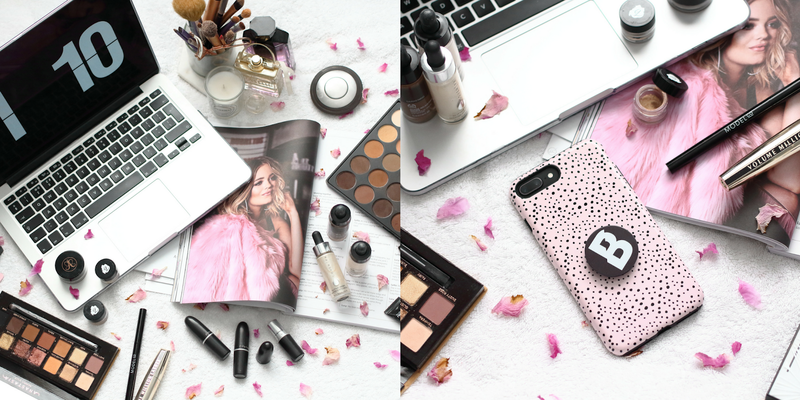 I'm also not ashamed to admit that makeup, magazines and rose petals don't just happen to fall onto my desk but are carefully constructed into pretty flatlays that are visually appealing. Is that deceptive? I don't think so. I don't photoshop my images to make myself look skinnier or to get rid of the scaffolding around the Sagrada Familia. Nor do I claim that detox tea made me slim when actually it's down to eating well and exercising plenty. Also, let's not forget that at the same time as posting these curated photos, many bloggers will also use their platform to talk and spread awareness of real life issues. Mental health, chronic illness, relationship advice and much more, are topics I regularly see being discussed by some of my favourite bloggers to help, inspire and educate their audiences, as they find the balance between the real and the fake. So while we bloggers, need to be careful not to take things too far when staging a perfect life and to remind our audience that life isn't always perfect. Consumers also need to use some common sense and take their own wellbeing (as well as others) into consideration when online. If you are that triggered by a mouthwash advert that you feel the need to start a witch hunt then maybe you shouldn't be online. In addition to this, if you want everything you see to be real and truthful then avoid any form of media, entertainment or people including (but not limited to) magicians, politicians, newspapers, the cinema, television and social media. So, come on and give bloggers a break for a change. Aside from qualifications, one of the most important things when it comes to getting a job is experience. In a world where degrees are more common and the job market is more competitive than ever I knew I had to maximise my employability, that's why I chose to do a year in industry as part of my degree. I made this decision 4 years ago when I was studying for my A Levels and looking at which universities to apply for. I had already decided that I wanted to do a marketing degree after studying A Level business and having done some work experience in the marketing department of an insurance company. But not all universities and courses offer placement years, so finding one that offered a marketing degree and a placement year, in a suitable location with the right entry criteria for me was a challenge. After a bit of research I had a couple of options, one of those being my chosen university: Aston. Aston University is relatively small (about 14,000 students where as the University of Birmingham has double that) university located in the centre of Birmingham. At Aston, around 70% of students undertake placement years and they have been offering placements for over 50 years. When comparing my placement experience to students from other universities, Aston's experience really shows in the level of support they provide to students finding a placement year. Aside from them offering a placement for marketing, the course was also well ranked in league tables and Birmingham was the right distance from home for me. Weirdly enough my dad studied for his degree at Aston and my sister was also based in Birmingham at the time, so it felt a little like fate. Three (nearly four) years later here I am, having completed my placement year, ready to share my experience with you. I'm going to be honest with you, finding a placement isn't easy. Along side studying and exams you've got the stress of writing a CV and cover letters to apply for jobs that you have no idea if you could do or not. While I'd had previous jobs in retail and had written a CV before applying for a placement can be very different. Many employers have a similar application process for graduate schemes as they do for placements, this can often involve numerous stages of online tests, assessment centres as well as phone and face to face interviews. Typically, the larger the organisation (or the larger the scheme), the more rigorous the application process is as the competition is fiercer. When applying for your placement my biggest tip would to be start applying as soon as possible. Get your CV ready straight away and look at the deadline dates for applications, so you don't miss any opportunities. Each company will start recruiting at different times so don't worry if you can't find a placement straight away as more opportunities may come up. But the sooner you find the right placement for you, the less you need to worry about it and you can shift your focus back to your studies. I started applying quite early and ended up applying for 4 or 5 jobs before finding my placement, but most people end up applying to a lot more before securing a placement. So where did I spend my year in industry? The answer to that is homewares retailer, Dunelm. I first saw the position at Dunelm advertised through my university's careers website, the role was for a marketing assistant based at their Store Support Centre in Leicester. Reading through the job description it seemed to fit what I was looking for perfectly, not only that but it was in an industry I was genuinely interested in and a city I was familiar with (my boyfriend's family live in Leicester). The thought of working at Dunelm excited me, so I applied. A few weeks later I found out I had got through to the next stage and had a phone interview, before getting through to the final stage the assessment centre. This was the first assessment centre I had been to so I had no idea what to expect, but we had a few group activities that looked at a few key skills including organisation, attention to detail and presenting skills. I also had to prepare a presentation for the interview that I had to present to various members of the marketing department. The assessment centre lasted till about 3 o' clock and by about 6 o' clock I'd had the call saying I got the job. The process was well organised and pretty smooth in comparison to some other larger companies. Originally the plan was for me to spend a couple of months within each area of the marketing department but this later changed due the needs of the business and also my line manager wanting me to see a project from start to finish. I'm quite glad this happened as I didn't want to start settling into a role for it then to change plus I still got to work with all of the areas within marketing that I was interested in. That was the great thing about Dunelm, they were so supportive in helping me make the most out of my experience whether that was through training or through spending time within different areas of the business. First the first 6 months of my time as a Marketing Assistant at Dunelm I worked with the Local Marketing Manager on new stores and refits, as well as supporting struggling stores. This involved planning and implementing campaigns to support these stores through driving footfall. This was a great role to start off with as it gave me a really great overview of marketing as I got to do a little bit of everything from brand to PR to social. Part of this role also included working on in store TV and radio. It was doing this that I got the opportunity to head down to the ITV studios in London and film with Holly Willoughby. This was so exciting and it felt incredible to be able to say that this was my job. During the second half of my placement I carried on assisting local but took on more responsibility from the PR and Social team. The main part of this included creating and scheduling the reactive content (mainly Twitter and Instagram Stories) as well as managing the Dorma Facebook page. During this time I also worked on the Dunelm and Kiddicare blogs as well as helping out with charity. 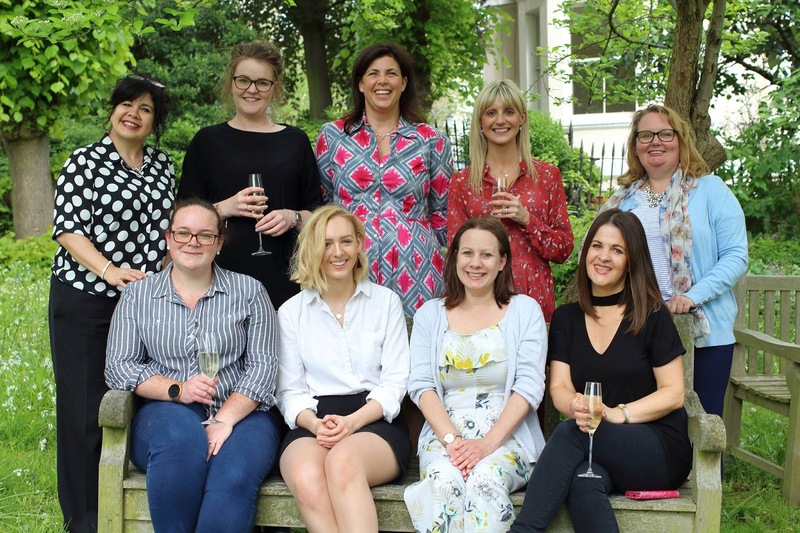 This was amazing, as yet again, I got to gain more in depth knowledge and experience within various different areas and also some incredible opportunities such as helping at Press Shows and meeting Home-Start UK ambassador Kirstie Allsopp. I honestly couldn't have wished for a better year, better colleagues or a better company to work for during my placement year. I feel like I had gained valuable experience in the work place that will set me up well when I have graduated and it has also made me excited to finish uni and start work. While getting a placement is tough, it is definitely an option worth considering as part of your degree. Are you considering a placement year? Feel free to comment below with any questions or drop me an email if you need any advice! Ever heard the saying ‘a bad workman blames his tools’ well when it comes to photography sometimes bad tools are to blame. You could be the best photographer in the world but if your image is grainy or pixelated it can ruined. Look for a digital camera with a high megapixel and the ability to change exposure and shutter speed. The Panasonic Mirrorless 12-60mm Lens Camera is a great option if you have the budget, as it has 30k optical zoom, 4K photo and video all in a compact design making it perfect for a variety of uses not just taking flat lays. While the background is not the main focus of your flat lay, it is the foundation of your photo. I always opt for a light, white surface as this is non offensive and won't distract from the focus of the image. 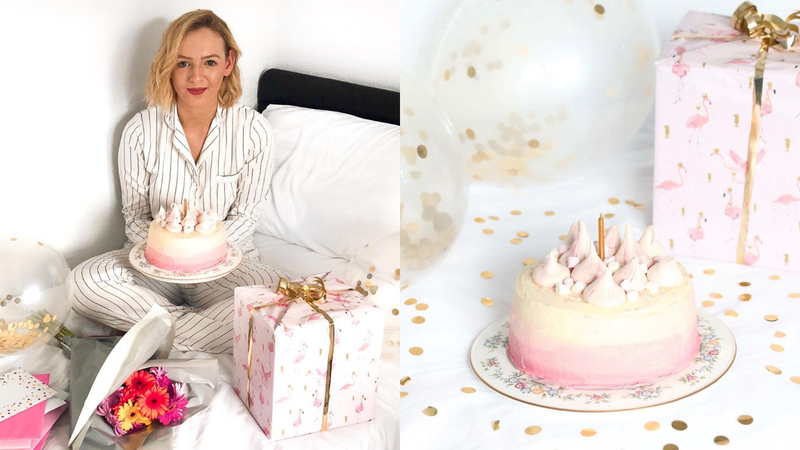 Don’t worry if you don’t have a white floor or table for your flat lays, simply lay a towel or white bed sheets on a flat surface and you have your background. This also allows you to move your white material around your house to find the best lighting. Time of the day - as the light changes throughout the day it will have different impacts on your image. At midday the sun is at its brightest and this may lead to your image being overexposed. Sunset (or the magic hour) can create beautiful soft lighting in images but can often have an orange tint resulting in the need to alter white balance. During the evening (or on a dark cloudy day) there is no light meaning you won’t be able to see your image. Positioning – it could be lovely and light outside but if you’re in a dark room you won’t benefit from it. Position yourself close to a window to maximise your lighting. Shadows – Depending on your positioning and the time of the day you can sometimes get quite harsh shadows in your images, especially if the light is coming from behind your objects. To avoid this try repositioning yourself or use a white piece of card to reflect the light onto the shadows. Some of my favourite flat lays have to be the ones crammed full of products and objects but they still somehow manage to look beautiful rather than a mess. To make this work, vary the size of the objects you are arranging and fill bare gaps with ribbons, petals or confetti. Also layer textures and objects such as magazines and patterned fabrics to break up your white background. A huge part of Instagram is how your profile looks with all of your images sitting together. Most people try to make this look more co-ordinating by having a ‘theme’. The easiest way I do this is through adding little accents of colour into my images to ensure they all co-ordinate. For example in the above images I have added hints of red through the strawberries on the pancakes and the rose petals. By keeping the rest of the image black and white and then adding this pop of colour means that they sit together nicely on my Instagram page. I have also done the same with the below images by adding a pop of pink. I will consistently use one colour in at least 6 of my images before gradually transitioning to a new colour if I want to change the look of my feed. 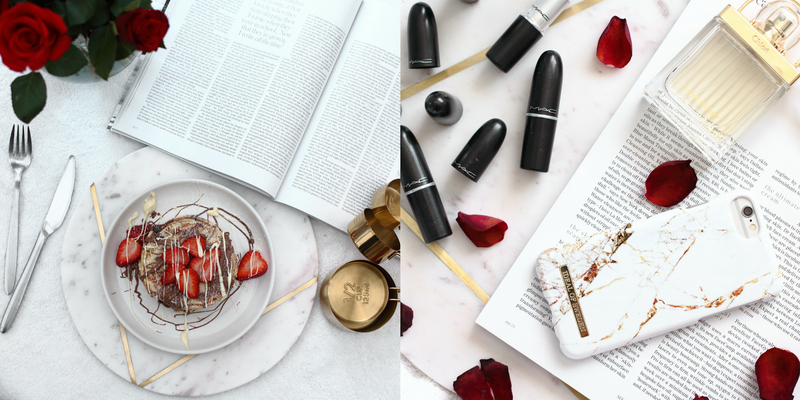 Flat lays may look easy but sometimes it can be hard to get them to look ‘right’. Take your time, moving different objects and adding bits or taking away items that don’t quite look right. With a bit of trial and error you will finally find the perfect arrangement to take your photo. What are your tips for the perfect Instagram flat lay? I have a confession. When it comes to skincare, I am lazy. While others are really into skincare it's always been a bit of a chore to me. I put my makeup on in the morning, go about my day as normal but by bedtime I really just can't be bothered anymore. Cleansing, toning, exfoliating. It's all just too much after a long day, so my skincare routine needs to be quick, simple and easy. In a situation like this many would turn to makeup wipes, as I have done in the past. But while makeup wipes are quick and easy, you end up paying the price when your skin looks like sh*t. It actually wasn't until I stopped using makeup wipes that I realised the tole they were taking on my skin and that perhaps, there were more ways in which I could improve my skin by changing up my routine. For a bit of context, I have problematic combination skin. Having suffered with acne since becoming a teenager, I have tried almost every spot product out on the market (as well as prescribed treatments like Roacutane) and come to the conclusion that I will always have spots. That being said the routine I'm about to share with you is the best combination of products I have found (so far) to reduce the appearance of my acne. Step 1 is always the longest step but crucially the most important; makeup removal. Where as in the past I would use makeup wipes (shameful I know) I now use a hot cloth cleanser. My favourite hot cloth cleanser has to be Liz Earle's Cleanse and Polish but at £15 a tube it's not cheap! Recently Aldi released their own hot cloth cleanser to rival Liz Earle's and for £3.99 (for double the amount of product) I thought it was worth a try! The Lacura Hot Cloth Cleanser comes with 200ml of product and 1 muslin cloth and claims to be suitable for all skin types. While I cannot say how it performs on other skin types, it works really well for me! It removes my makeup with ease (just as well as Cleanse and Polish), has a slight soft scent and leaves my skin feeling soft and smooth. I simply just rinse my face with some warm water, massage the cleanser into my skin and then wipe it off with the warm, damp muslin cloth - easy. The next step is very quick and easy, as I just spritz my face with the Glo Skin Beauty Balancing Mist*. Designed to balance the oily and dry areas of combination skin, the Balancing Mist also works hard to optimise the effectiveness of your skincare routine by preparing your skin to evenly absorb the products applied after. It leaves my skin feeling fresh and I honestly notice a difference in the appearance of my skin the next morning when I use this product as part of my routine. Next I will use The Ordinary's Niacinamide 10% + Zinc 1%. This is the only product in my routine targeted toward 'acne prone' skin and I don't use this every night. Instead I will use it when my skin is really bad or if I want my skin to look really great the next day. All I'll say is that it's affordable and works (if used sparingly), but if you want more information on this product read my in-depth review. While this is the last step in my routine, I must admit that I don't always moisturise in the evenings. After being on Roacutane I learn that moisturising my skin too much can cause my breakouts, so unless my skin is feeling really dry I will only apply moisturiser to my face before I apply my makeup in the morning. I like to use Oilatum as it's fragrance free and is the best thing I've found for getting rid of dry skin. I am quite prone to getting eczema on my hands and occasionally on my face as well as dry patches around my nose, so Oilatum is a lifesaver when my eczema is playing up. It's also affordable and you get a lot of product for your money, so I don't mind using it for other dry patches or eczema on my body. Sometimes I will do all of these 4 steps other times I will just do one or two. It really depends on how much time I have and how I want my skin to look and feel. This routine is also affordable which is a must for me. I hate having to spend money on skincare as I don't find it fun in the some way I like spending money on makeup. It's also quick, which when your are pressed for time or get really tired in the evenings (like myself) is important. Ever since moving to Leicester eight and a half months ago I have got to know the city pretty well. While I had visited the city a few times before, you never fully know a place until you live there. Leicester is a nice medium sized city in the East Midlands known for it's links to King Richard III, Kasabian and the underdog Leicester City Football Club. As well as good links to Nottingham and Birmingham it has plenty to offer itself, including the city's main shopping centre: The Highcross. With over 120 shops the Highcross is well known for it's shopping but thanks to the lovely guys at the Highcross* I spent the day learning what else the shopping centre has to offer. First on the itinerary was a cake and a coffee at 'The Place to Eat' in John Lewis. Shopping can be surprisingly tiring so I often find myself looking for somewhere to go for a refreshing drink and a delicious cake. While Leicester has lots of great independent coffee shops, they are a bit further out of the centre so the convenience of a café in John Lewis makes 'The Place to Eat' an instant winner. Not only is it convenient but the cakes are delicious! I had a cookies and cream cheesecake that was to die for while Karl had a classic chocolate cake, delicious! Next we headed on down to the beauty department where John Lewis have opened their brand new &Beauty Nail and Brow Bar. The beauty bar that opened in the store just a few weeks ago offers everything you could imagine for your nails and brows from a classic manicure to LVL Lash Enhancement all at really competitive prices. While I was at &Beauty I had a gel manicure and my eyebrows threaded and I was so impressed with the service I received. I was a bit worried at first that the treatments wouldn't be very relaxing as the &Beauty Bar is quite visible in store so other customers can see you having the treatments done but it was so relaxing you soon forget where you are. The girls created a luxury spa like atmosphere through the use of Pink Boutique products such as their Cuticle Oil, Crystal Sanitiser and Massage Oils. Not only do the products smell gorgeous but they are all non toxic, organic, vegan and cruelty free! So unlike other nail salons the girls do not wear face masks and you have peace of mind knowing that the products are good for your nails and skin. The OPI Gel colour took 45 minutes and I had my cuticles trimmed, nails shaped and buffed as well as 4 coats of colour to make sure my nails were ultra shiny and opaque. They are so confident at &Beauty that your gel manicure will last two weeks that if they chip before then you can go back and they will fix them free of charge! I also had my eyebrows threaded while I was there which was very quick and only took 15 minutes! I had never had my eyebrows threaded before so was a bit nervous as I like my eyebrows to look quite thick but they did such a good job at defining my brows without making them look thin. Firstly she removed my makeup around my eyebrows before threading and then trimming them. While it did make my eyes water quite a bit it wasn't too painful and definitely something I would get done again! We then headed to GBK for a late lunch. Myself and Karl are both big fans of Gourmet Burger Kitchen having been quite a few times before. No matter which GBK I go to I always know I'm going to get great food and service, and GBK in the Highcross was no exception. Both of us had a classic GBK Cheese & Bacon Beef Burger with Skinny Fries and they were delicious. If you have never had GBK's skinny fries before you seriously need to try them because they are amazing. Not only is GBK delicious but each restaurant has such cute retro decor, featuring scrabble wall art, industrial furniture and beautiful lights. They also have a loyalty app so if (like myself) you go to GBK quite often you can earn rewards and get special deals! Have you visited the Highcross before? * While this is not a sponsored post the Highcross did pay for all of my food and beauty treatments. This in no way affects my opinions and all opinions are my own. For more information please see my full disclaimer. Ah Instagram. It's like the ex that no matter how many times they hurt you, you keep finding yourself running back into their arms. Once madly in love and a little bit obsessed, your relationship has changed (thanks to that pesky algorithm) and has become incredibly hard work. Social media was never designed to be hard work. It was designed as an online platform to meet new people, make friends and share the things you love with like minded people not for competition and advertising. It is so frustrating when you post a photo to your followers (real people who have basically said 'Yes I want to see their photos!') and Instagram will only show that post to half of your following. It's equally frustrating when I see paid for ads from accounts I already follow because why should they have to pay to appear in my feed? But it's not just the algorithm that's getting me down, it's the way I constantly compare myself to others. By that I don't mean your typical 'omg she is so much prettier/skinnier/etc than me' I mean that I compare my account to others. I'll see someone doing an AD for a brand and click on their profile to see how many followers they have. If they have less or about the same as myself, I'll start wondering why they were picked over me. Or I'll see accounts I love growing their following and hitting big milestones, and while I'm happy for them, I'll feel down because my account isn't growing as quickly. It's toxic and I hate that this is the person I've become. I work hard using every spare minute I have at the weekend to take photos for my Instagram, I try to post everyday and also engage with other people, yet nothing seems to work. As soon as my followers go up they fall straight back down, my engagement is still a lot lower than it was before the algorithm change and in all honesty I don't have enough money to pay to advertise my posts. I could cheat and buy more followers but we all know my opinion on that. The other day one of the girls from work mentioned that she'd heard of this new social app called Vero that is apparently like Instagram but without ads and algorithm, we were all intrigued but wary that it may never take off. Then just the next day I was watching Vix Meldrew's Instagram stories and she mentioned this app again saying that is had already crashed because so many people were downloading it. After looking at reviews of the app on the App Store I realised that I wasn't ready to move on to someone new. These apps are all the same. They lure you in with their promises but as soon as they gain a bit of confidence they ruin your relationship through advertising and money making schemes. So despite how much I hate Instagram it's better the devil you know. Maybe one day they will realise the errors of their ways and we can relive 'the good old days'. But for now I'll keep trying to make things work, until eventually something better comes along. No bad ever came out of someone being too prepared and that is the approach I am taking for SS18. So while it might be raining outside and sometimes snowing on occasion, nothing is going to stop me preparing for spring even if it is over a month away. There is nothing more striking than an all white outfit. Simple and pure yet ever so daring (and no I don't mean because of how easily white stains)! That combined with pretty lace just screams spring to me enter the Coast Itzel top*. Designed in a pretty floral lace with a high neck and tie back detail, the Izel Lace Top is perfect for both a day out shopping or a romantic meal out. Playing with smart/casual vibes, I've paired it with raw hem denim culottes (a comfortable alternative to skinny jeans) and these simple natural heels from Office. For a slightly more classic option I've gone with the Jemima Spot Mesh top* paired with simple black jeans. Black and white spots were quite big last summer and I can only see them being even bigger this year having featured on the catwalks of Carolina Herrera and Rodarte. The simple mesh overlay and cutaway shoulders make this delicate top ever so flattering and one I can see myself wearing quite often this coming season.